A initial meeting is held at your home to see the space and talk about your thoughts. This process allows ideas to be formulated. It includes reviewing an idea book that illustrates a variety of design styles and color schemes. We analyze the results to determine your specific style…we want your home to be a reflection of you and your personality and mostly we want you to be surrounded by colors and furnishings that make you feel good. Based on prior meetings, a preliminary conceptual design scheme is presented. 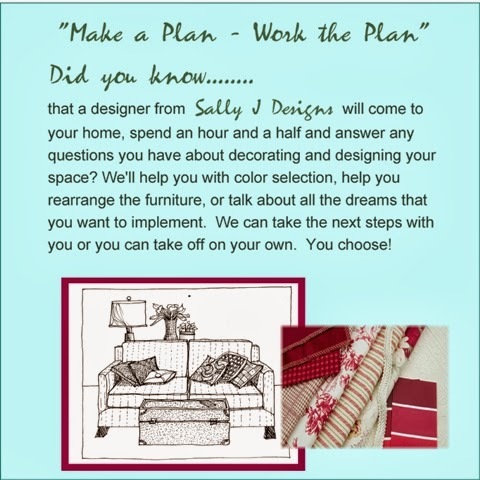 Various interior design elements are depicted with photos, sketches, magazine shots and samples of finishes, such as flooring, countertops, cabinetry, wall and window treatments, lighting and hardware to help you visualize our design plan. Once the concept has been accepted and approved, several meetings may take place in showrooms or in your home to view additional samples. Specific design details are discussed in greater depth during this phase. Contractors are recommended based on the project. The contractor will provide us with a negotiated bid based on current market values and a remodeling project timetable evaluated by Sally J. Designs. Pre and post construction meetings and onsite visits during construction are conducted, ensuring the fulfillment of design intent and maintenance of quality levels.